Fortune magazine is today perhaps better known for giving us the Fortune 500, just as the Financial Times Stock Exchange (FTSE or ‘footsie’) index might be more extensively quoted than the newspaper that gave it its name. Guinness is better known by kids for its book of records than for the “black stuff” consumed by adults and app market data and analytics company App Annie is another brand that might be as well known for its consumer index that charts the popularity of mobile apps, but both efforts are doing pretty well. The six-year-old company has an interesting past, present and future. A polyglot enterprise, it started out in Beijing although it is now headquartered in San Francisco. It continues to be led by its Paris-born co-founder Bertrand Schmitt whose surname points to his family’s links to the Alsace region close to the German border; another founder Bjorn Stabell, is Norwegian. And as with so many startups today App Annie can trace its roots back to the day in 2007 when Apple detailed its plans for a certain mobile device. To paraphrase Thomas L. Friedman, the world had become flat. After 20 years in B2B mobile and with deep experience in in data analytics at Gomez, Schmitt felt that providing information and insight on the emerging ‘App Economy’ was an obvious next move and App Annie eventually launched in 2010, capitalising on the trend towards self-service download stores, faster cellular networks and the emergence of Android-based devices. Less obvious was a move to Beijing but Schmitt saw China as an emerging ground zero for the new mobile world and relocated there accordingly. “I wasn’t speaking a word of Mandarin so the first few months were tough…” he recalls, laughing. With distribution and generating awareness effectively built into the app store model, Schmitt didn’t have to hang around long before App Annie – the name is a sort of pun on ‘nannying’ or nurturing apps – started to build a reputation. Since then, progress has been consistently strong even if one blip, tackling the e-books segment, was quickly canned for being “too expensive to serve” compared to the more dynamic and faster-growing apps field. Today, one million apps tap into App Annie’s entry-level free cloud-based analytics service. The money comes from those paying for a premium service that includes extras such as dashboards on top of core services tracking downloads, demographics, advertising and in-app purchasing. Customers get a better idea of how to invest in product directions, geographies and monetisation models. App Annie employs 450 people, 200 of them in engineering, product development and data science. As Schmitt notes that’s more even than some traditional software companies. Schmitt calls App Annie a “quite typical software-as-a-service business” with purchasers paying a regular subscription, although he admits he sometimes has to fight the notion that it’s a market research company, thanks to the success of that App Annie Index that is widely touted in the same way that Billboard was once used to track music sales. The Index is great PR, Schmitt says, but the core service is letting app publishers see what’s working and what’s not, including comparing and contrasting where they are doing well and where they can improve versus rivals. A publisher might think s/he has deep knowledge but only by looking at the hard data can you build empirical evidence or see how others might have succeeded by following a different route. Some data is blunt and obvious, other data less so: after all, when App Annie was being developed plenty of people saw a bright future for BlackBerry and Windows on smartphones and consumer choice of operating system or platform is among only the most basic revelations the company offers. Today, users want to know about retention rates, levels of usage once downloaded, demographic signifiers, discoverability pointers, and striking correlations. Such as? Schmitt notes the very high percentage of US female users for Pinterest’s app. What was “virgin territory” when App Annie started is now well established and current plans call for extending further afield to Spain, Germany and Indonesia. Schmitt is still a big fan of China and says he initially saw the US as too expensive but the company has been happily settled in America for two years. “The big internet companies are training people at scale and it is only possible in California,” he says. Even more than improving on data inputs and what was a “a pretty bad UI” originally, there has been a focus on data accuracy to prevent the old Garbage In, Garbage Out syndrome from striking. Schmitt reckons App Annie has over 80 per cent market share in its space with 700-plus premium clients and annual revenues in tens of millions of dollars: about 50 per cent of business comes from north America, 35 per cent APAC and 15 per cent Europe. App Annie has collected $157m in financing from name-brand investors including Sequoia, “not just someone who wants their money back in two years”. That funding has helped justify three acquisitions and the company now has software development in three continents. “We’ve not been shy when there are a ways to accelerate our time to market,” Schmitt says. So what’s on his master to-do list if we were to look at his desk? ”There’s not much on my desk; I’m a digital guy,” he deadpans, but of course growth is always a leading agenda item and he wants to build on the current roster of games makers, social networks and enterprises like Shell, Coca-Cola and AstraZeneca that are customers today. 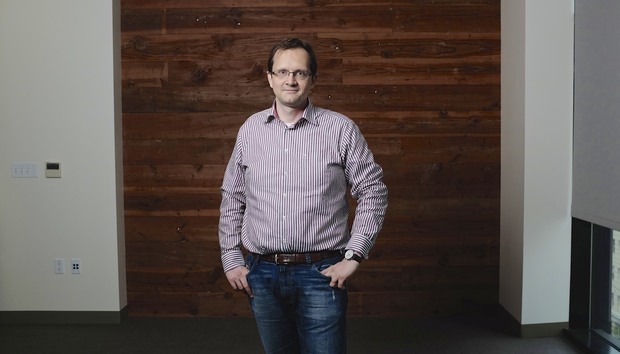 Asked for companies he admires, he names Tableau for “democratising access to data”, Salesforce for its marketing and ecosystem development and NetSuite, the cloud ERP firm whose CEO Zach Nelson sits on the App Annie board. Schmitt appears to sit somewhere between the roundhead approach of chasing profits ASAP and the cavalier model of just focusing on revenue, saying that the plan is to be “cash-flow breakeven” but not cash-flow positive, inside 18 months. The market will be driven organically he believes from mega-trends such as having three billion people around the world using smartphones today becoming six billion soon enough, helping to further change, well, pretty much everything. An IPO? “All funding opportunities” will be examined although it’s interesting that recent executive recruits all have experience of public companies, including Zynga, Oracle and SAP.